Like all my experiences at Hostel Ones this was an amazing time! You can’t go wrong staying here! The most fun and energetic hostel experience you’ll find. The location and staff are great, and the activities you do (walking tours, group dinners, drinking games, etc.) are so inclusive and fun. They were definitely the highlight of my stay in Barcelona! Incredible. Great value for money with tons of fun events and free dinner every night (for tips). Cheap breakfast in the morning as well. Fun tours every day and the free bar and club expeditions are GREAT. I love this hostel! The staff are so energetic and welcoming and the rooms were some of the best I stayed in during my entire trip abroad (clean, good privacy even in dorms, comfortable). The dinners were a great way to meet people and the daily activities were amazing! Can’t wait to come back. Amazing stay here! Property was very clean, and a great atmosphere. All of the staff were incredible and they had the best hosts anyone could ask for! Showed us all a great time every night we went out. The dinners cooked for us were amazing as well. Will definitely be back and recommend Paralelo to anyone visiting Barcelona! Excellent place for solo travelers to stay. The vibe is awesome, there are activities/meals every night, and the staff are good at what they do. Special mention to staff member Jonida. She found out about an upcoming trip I had to her hometown, and went out of her way to make a detailed itinerary of what I should do there. This is one example of the staff's inclination to go above and beyond. Overall, Hostel One is a great choice. The only Hostel with curtains on the bunk beds which for me made a huge amount of difference compared to my stay at other hostels. I would have gladly extended my stay if they had availability. My stay at Hostel One Paralelo was a great experience. The staff were super friendly, helpful and welcoming. There was an all-round good vibe at the hostel. 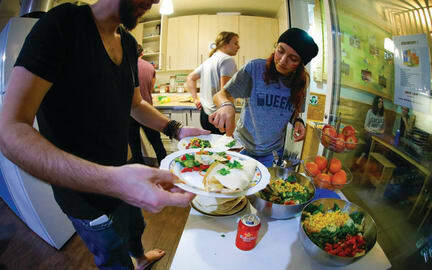 The free family dinners and drinking games were a nice way to meet other people staying at the hostel. The dorm rooms, bathrooms and communal areas were super clean. The shower cubicle was a tad small but something to usually expect at hostel showers. I really loved staying here! It was such a fun environment wish I had more time to stay there! The host/workers are so nice and gave great recommendations for places to go in the city. It is a five/ten minute walk to the metro, would totally recommend this hostel for anyone looking to have a good time. For solo travelers it would be so easy to make friends with the hostels activities they put together!